Rockabilly personifies the American music scene of the 50’s. The burgeoning electronic revolution put the electric guitar in the hands of musicians. The record industry exploded into big business. Communications media exposed the general population to a wide variety of musical styles from the different cultures and regions of the country. And the musical styles themselves began cross-pollinating to trigger the music renaissance of the 60’s and beyond. Rockabilly blends Blues, Country, Western Swing, Boogie-Boogie, Honky-Tonk and Appalachian folk music — as American as you can get! Rockabilly has evolved over the decades and the requisite techniques and harmonic considerations to play all of the styles and sub-genres make it both challenging and very rewarding to play, especially for guitarists. 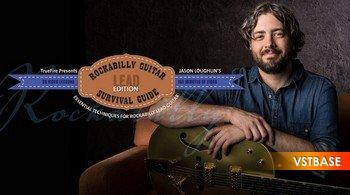 Jason Loughlin’s Rockabilly Survival Guide for Lead Guitar is an intuitive hands-on curriculum designed to impart the specific techniques and harmonic considerations required to play lead Rockabilly guitar. Jason organized this Lead edition into two main sections. In the first section, Jason guides you through 13 key concepts and techniques. In the second section, you’ll play your way through 7 Performance Studies covering a wide variety of Rockabilly grooves, tempos and keys. The 13 key concepts and techniques that Jason focuses on include: Double Stops, Rockabilly & The Blues, Dead Thumb, Open Strings, Common Soloing Chords, the Bigsby, the Boogie, Travis Picking, Outlining Chords, Substitution, Using the ii V, Whole Tone & Diminished Scales and Chord Melody. These are the essential tools and harmonic blueprints for constructing engaging and creative Rockabilly solos. In the second section, you’ll put all of your Rockabilly tools to work by following Jason’s blueprints for 7 diverse and colorful performance studies representing different styles or sub-genres of Rockabilly: Study #1: Rock and Roll, Study #2: Boogie, Study #3: Travis, Study #4: Swing King, Study #5: Trucker Twang, Study #6: Blues and Study #7: In A Chord Dance. Jason demonstrates all of the leads over rhythm tracks and then breaks them down measure-by-measure, technique-by-technique. You’ll first learn the parts as performed by playing along with Jason and referencing the tab and notation. When your ready, you’ll work with the rhythm tracks on your own and craft your own Rockabilly lead parts. All of the key demonstrations, performances and examples are tabbed and notated for your practice, reference and study purposes. You’ll also get Guitar Pro files so that you can loop and/or slow any section down as you work through the lessons. Plus, Jason generously includes all of the rhythm tracks for you to work with on your own. Grab your guitar, a pair of blue suede shoes and let’s get your Rockabilly on!